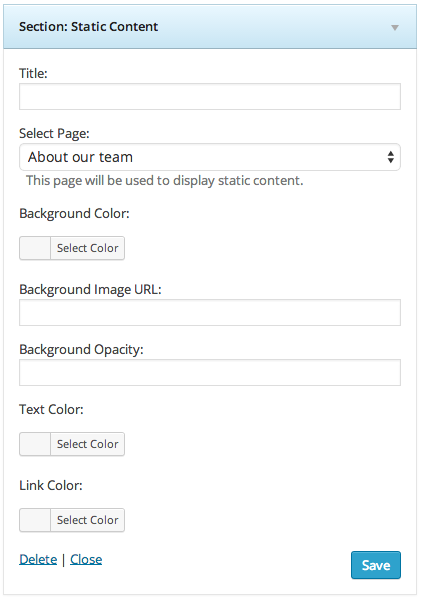 At Appearance > Widgets is where you will be customizing the appearance of the homepage and the about us page. You can do so by adding any of the "section:" widgets to the corresponding widget areas and then define their layout. This widget simply outputs the slider section. You can add/edit the slides at the Slides tab. This widget outputs the service boxes. 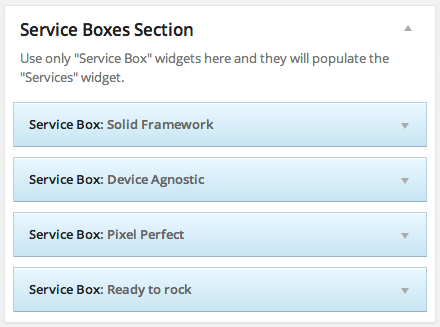 For each service box you can set a title and a description. you can use one of our six available icons or upload your own icon from Media > Add New and paste the link of the icon to the Custom Icon URL field. Repeat the process for the other widgets. Make sure you hit Save after configuring each one of them. 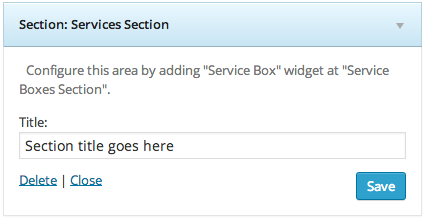 After that, make sure you add the "Section: Services Section" widget at the homepage widget area. This widget outputs a portfolio section. 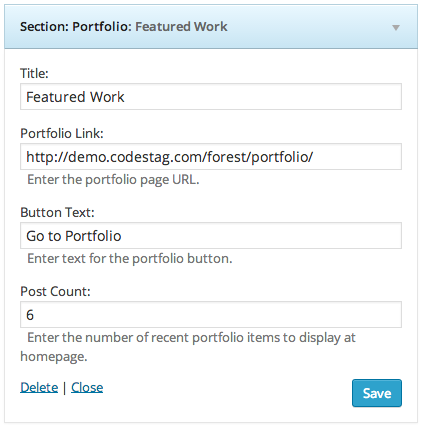 There are a couple of easy settings to customize this area, such as how many portfolio items you want to display at the portfolio section. Please note that these options only take effect for the widget, and not the actual page. You can also have a section to display client logos by using this widget. First step is to upload the logos as images. You can do this from Media > Add New. The suggested dimension for each logo is 266 x 206 pixels. 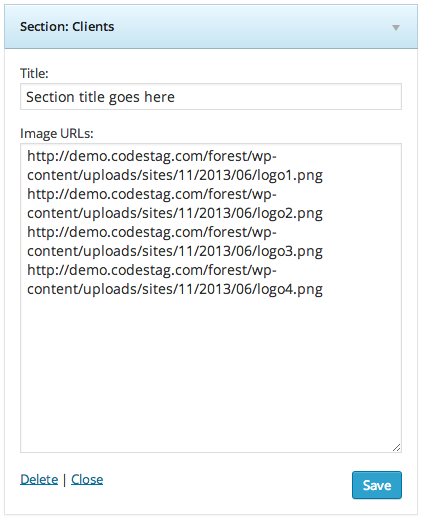 Once uploaded, copy the image url for each image, and paste them at the Image URLs field at the widget. Note: You must paste one image URL per line (see screenshot below), one right after the other, without spaces or line breaks. This widget outputs the team members boxes. This widget outputs the section with testimonials.